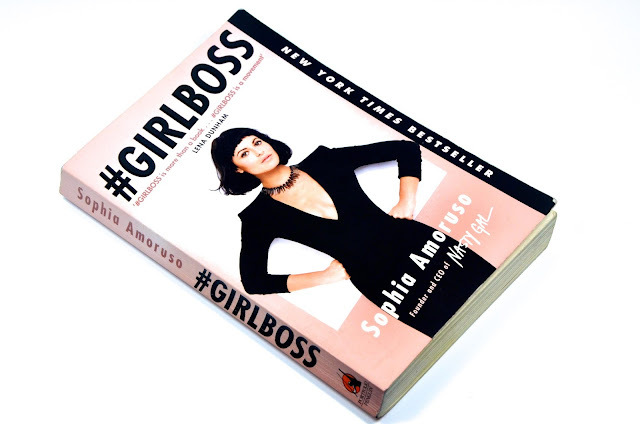 If you haven't already read the New York Times Bestseller #GIRLBOSS by Sophia Amoruso, you've probably at least seen the hashtag about a bazillion times on Twitter and Instagram... It's a book, it's a movement, it's a radio program and soon it will be a television series on Netflix. Though she may seem to have it all now, Sophia Amoruso didn't start out that way and has had a super untraditional path to success. If you often feel like you have a snowball's chance in hell of being successful, either as an employee or an entrepreneur, then this is the book for you! Irreverent, fun and easy to read, #GIRLBOSS is both an inspiration and a modern-day how-to for winning at life. Sophia Amoruso didn't have what most people would consider to be a great start at life. She didn't do well in school, was diagnosed with depression and ADD and basically fell through the cracks. Fast forward to her quitting school, hitchhiking and dumpster diving a few years later and it's not entirely surprising to find out that the first thing she ever sold online was stolen. Amoruso is proof positive that there's no one path to success and that no matter who you are, what you've done or what schools you attended, if you have a good work ethic, common sense, a bit of creativity and a lot of fierce determination, you can make your own way when the traditional paths have failed you. #GIRLBOSS chronicles Amoruso's path to e-commerce success from the beginning when she worked in retail stores, shoplifted and later took a job as an ID checker at a university in order to get health benefits. It was there that she was so bored that she came up with an idea for selling vintage fashion on eBay and it changed her life. She discovered something she was excited about and invested, finding that the need to make it happen took over, gave her focus and something to be proud of. With no managerial experience, very little education and no financial backing, Amoruso traded an MBA for some good old fashion common sense and took the online vintage market by storm. Having no credit, investment or debt of any kind in the early days of Nasty Gal, Amoruso shows that you don't need to be rich or have support to create something successful and get some money in the bank... Simple things like responding to customers regularly, giving customers what they need to be confident in their purchases and managing money well can go a long, long way. A tongue-in-cheek book that reads more like talking to your best gal pal than typical business books, #GIRLBOSS kicks tired old traditional theories about how to achieve success in the teeth in a way that's current, relevant and written for today's hungry go-getters! Whether you work for someone else, have your own business, write a blog or are contemplating a new path, this book is a gem for the modern age workhorse. Sophia Amoruso is a total badass and her passion for the work she does is contagious. The world is changing, in many ways for the better and #GIRLBOSS is a book that embraces that change and encourages more of it. I definitely recommend this book. It's inspired me beyond all expectation and taught me a lot of things about about business that I didn't learn from my traditional university education... If you haven't read this book yet, it's time to let out your inner independent woman and channel your inner #GIRLBOSS with this fun, enjoyable book.